After traveling A LOT recently, I desperately wanted to get back into my kitchen to cook a comforting dinner. For inspiration, on my flight back from Cayman Cookout, I read the January issue of Food & Wine. One of the articles, “Hot Dish Challenge”, featured Chef Gavin Kaysen and his Harissa-Spiced Cassoulet. The pictures looked mouth watering and I knew it was something I wanted to try. Harissa is a spice from North Africa made of cumin, coriander, caraway and other spices, and is incredibly earthy and comforting. I thought it was a brilliant way to add some creativity into this classic dish. For those of you who don’t know Chef Gavin, I highly recommend you get on board. 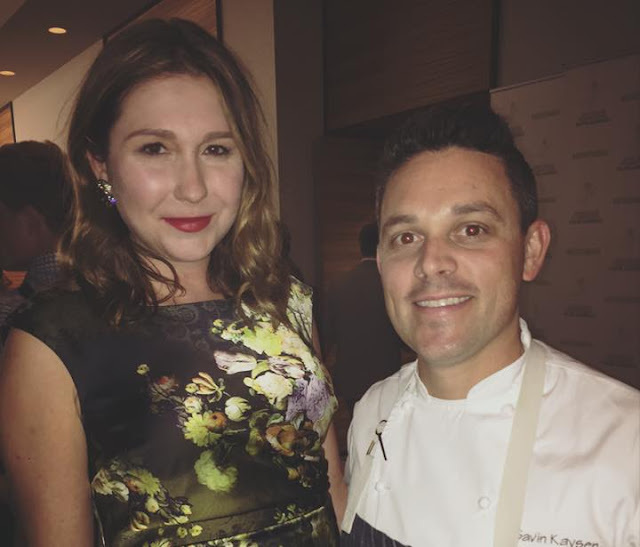 I was lucky enough to meet him at a James Beard Foundation's TasteAmerica event in Minneapolis a few months ago, and I’ve been hooked ever since. Not only is he extremely talented, he is one of the most humble, funny and sweetest Chef that I have EVER met. The recipe calls for thick-cut bacon, merguez sausages and rustic bread, so naturally I headed to Publican Quality Meats to pick up those ingredients for Kaysen’s Cassoulet. In a large enameled cast-iron casserole, cook the bacon over moderately high heat, stirring occasionally, until the fat is rendered. Add the onion, celery and diced carrots and cook, stirring occasionally, until beginning to soften, about 8 minutes. Add the beans, cover with water and bring to a boil. Reduce the heat to moderately low and simmer the beans until al dente, about 20 minutes. Remove from the heat, add a generous pinch of salt and let stand for 30 minutes. Drain the beans, bacon and vegetables and transfer to a bowl; reserve 2 cups of the cooking liquid. Meanwhile, preheat the oven to 350°. In a small skillet, toast the cumin, coriander and mustard seeds over moderate heat, shaking the pan, until fragrant and the mustard seeds begin to pop, 3 to 5 minutes. Transfer to a spice grinder and let cool. Add the smoked paprika and crushed red pepper and grind the harissa blend into a powder. Wipe out the casserole and heat 2 tablespoons of the olive oil in it. Add the merguez and cook over moderate heat, until lightly browned all over, about 5 minutes. Transfer to a plate. Do not wipe out the casserole. Add the sweet potatoes, turnips and large carrots to the casserole. Season with salt and black pepper and cook over moderately high heat, stirring occasionally, until the vegetables begin to soften, 5 minutes. Add the harissa spice blend and cook until fragrant, about 2 minutes. Stir in the bean mixture and the reserved 2 cups of cooking liquid and bring just to a simmer. Arrange the merguez on top. Cover and bake the cassoulet for about 1 hour, until the beans are tender and most of the liquid has been absorbed. Remove from the oven and uncover the cassoulet. Preheat the broiler. In a bowl, toss the bread, parsley, lemon zest and the remaining 3 tablespoons of olive oil; season with salt and black pepper. Sprinkle the bread over the cassoulet and broil until golden and crisp. Let the cassoulet stand for 10 minutes before serving. Pass yogurt at the table. Enjoy! That is one hell of a job done! YOU LOOK BEAUTIFUL AS ALWAYS.